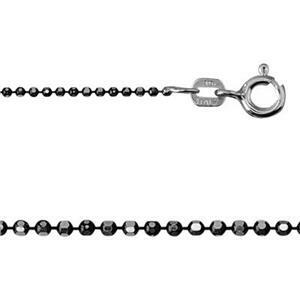 The 1mm Ruthenium Plated Diamond Cut Bead Chain is now a staple chain for the pendants I make. This chain has an outrageous sparkle! I love the black contrast against that lovely sparkle. It is a surprisingly strong chain. I feel comfortable putting a bigger pendant on this chain and feeling secure that it can hold up to the weight.